With the passing of Christmas and the arrival of the NFL postseason, minds turn to one of the premier football toys from the era before kids were able to hook video game consoles up to the living room TV. 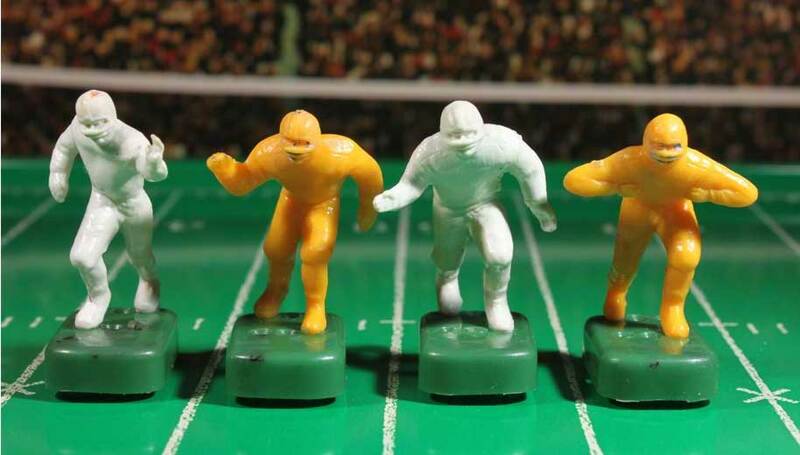 Before Madden, before Tecmo Bowl, before Atari Football even—there was Electric Football. The “electrification” of toys was a natural outgrowth of the widespread household electrification in the US from the early 20th century through the 1930s. Electric model trains, first developed in the 1890s and then resurrected in the 1920s by eventual toy train giant Lionel, were the first widely popular electrical toys. 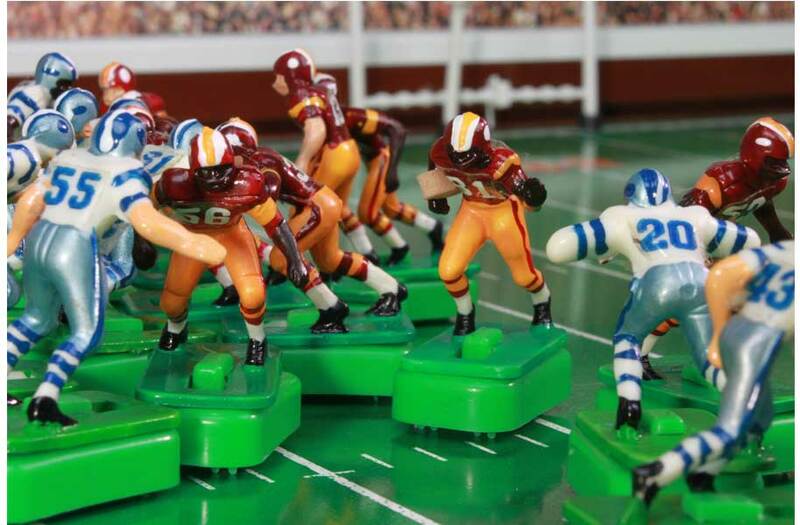 Electric football emerged, like other iconic Baby Boomer and Generation X toys, in the first years following the Second World War, as the peacetime American economy roared back into production. In the years before World War II, the New York City-based Tudor Metal Products, whose main line of products included home safes and filing cabinets, produced several electrified racing games that produced movement by vibration on a metal plate, sending figurines representing race horses or cars skittering along a track. Norman Sas, the son of Tudor Metal’s president Elmer Sas, took over Tudor in 1948. During and immediately after the war, Norman had obtained multiple degrees at MIT (including one in business), had served as part of the Navy’s supplemental wartime V-12 officer training program, and had worked briefly as an engineer at GE. Soon after his arrival, he considered the old horse racing games and thought that a football tabletop game would make better sense as an application of the technology. Tabletop sports games, like war games, had been around for decades at this point. Most involved using manual dexterity for real-time competition, such as button football, table football or foosball, table hockey, and the postwar British innovation in tabletop sports, subbuteo. But electric football largely dispensed with immediate hands-on manual control of the playing pieces. 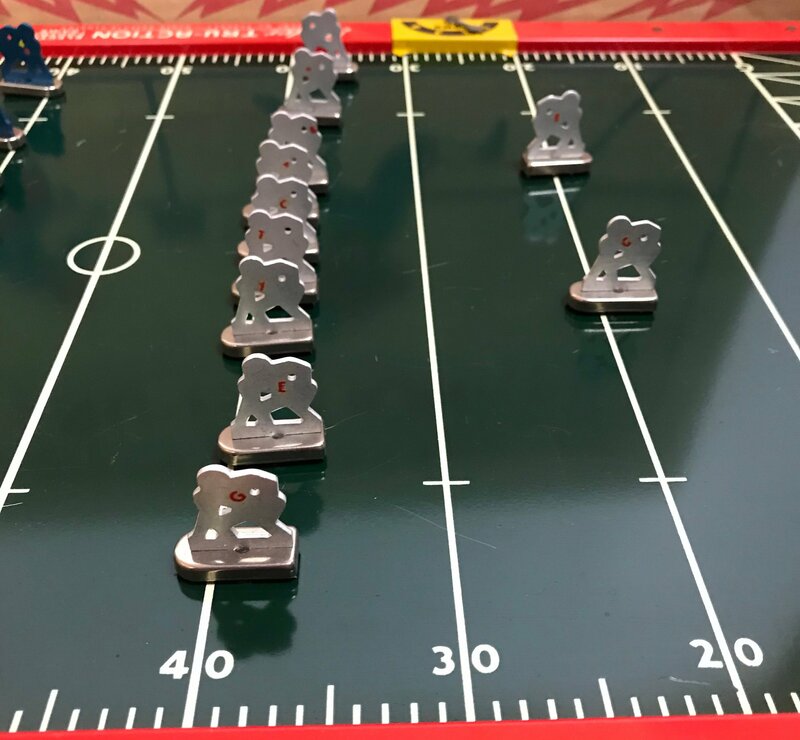 There was still individual skill involved with coaching: quarterback and kicker figures had moving arms and legs that could fling the game’s tiny foam footballs to receivers, and an electric football coach could adjust the figures’ bases to make the figures (ostensibly) head in a certain direction. 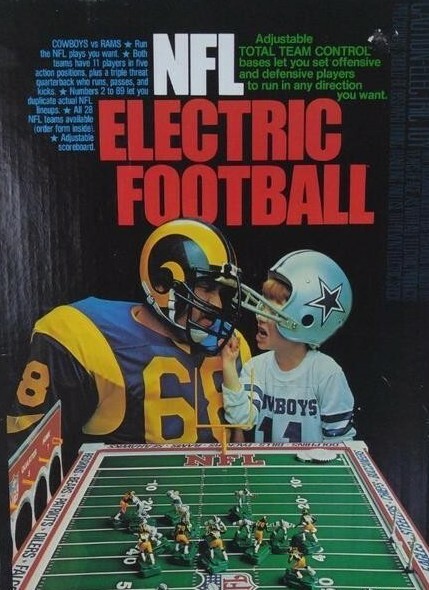 Electric football was sold for its first decade and a half with 2-D representations of players. Thanks to the efforts of Tudor’s designer, Lee Payne, fully sculpted 3-D plastic figures arrived in the early 1960s, at which point the game became a huge success. 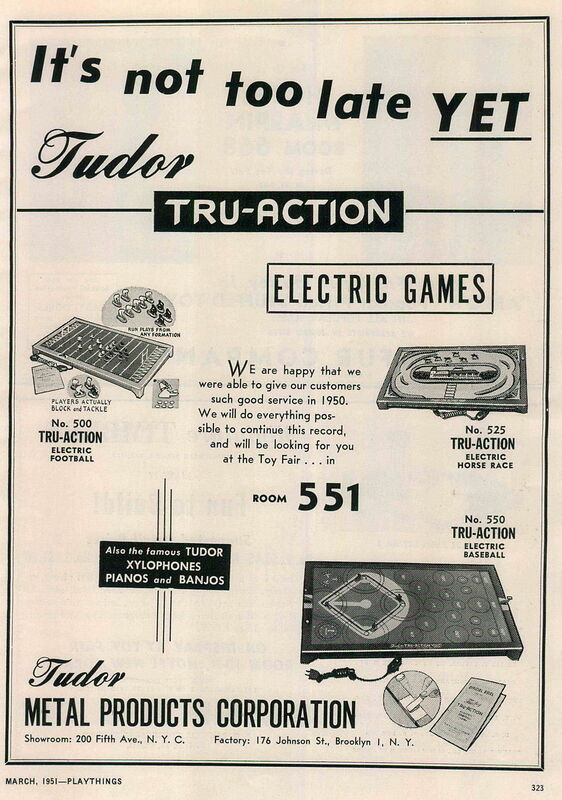 From the mid-’60s on, as professional football grew in nationwide stature and the two rival leagues up to this point, the AFL and NFL, kicked off the first interleague championship and eventually merged into a single NFL, Tudor’s Electric Football became officially licensed by the NFL. 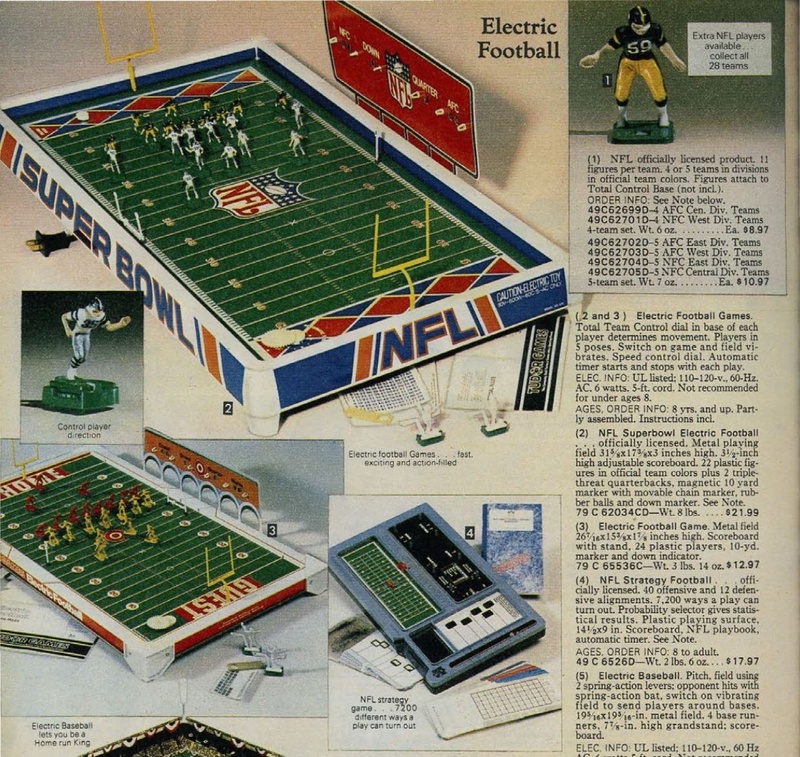 Arguably, until the arrival of home video games, home computers, and handheld electronic games in the late 1970s, electric football was the premier football simulation game on the market. This author received a Rams/Cowboys edition at Christmas in 1982 and tried desperately hard to learn all the subtleties of adjusting the figure bases to plan plays and open up a lane for a running back to jitter all the way down the field. As with subbuteo in Britain, electric football hobbyists and leagues in North America persist to this day. Tudor still manufactures an array of different playing fields, figures and bases, and a recent authoritative history of electric football, The Unforgettable Buzz, commemorates the story of this Cold War-era Christmas gift classic.